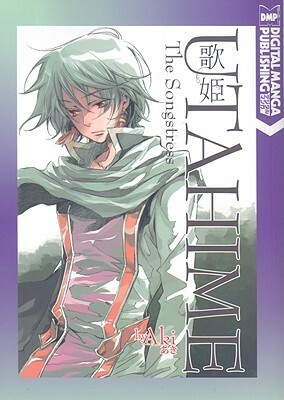 Olympos was written and illustrated by a mangaka known as aki. Outside of her manga Utahime, which was published by Digital Manga Publishing, her other works like Hana Matsuri and Arusumente have yet to be published in English. On the day of his coming-of-age festival, Ganymede, the prince of Troy is torn away from his homeland and family by the beautiful god Apollo. Ganymede wakes up in a land blanketed by an eternal starry sky, and filled with infinite flowers underfoot. He is gleefully informed by Apollo that he is now in Zeus’s “miniature garden”, and has been granted immortality for the sake of acting as a plaything for the gods themselves. Angry and frustrated of his situation, Ganymede attempts to escape the garden, but finds that there truly is no end to the floral landscape. When not harassing Ganymede, Apollo fills the remainder of his time chatting with his sister Artemis, exchanging banter with the quick-tempered sea god Poseidon and dropping down to the human realm to quietly express his disgust at the macho statues erected in his honor. He pseudo-befriends a woman named Iris, who was meant to be sacrificed to him, and instead Apollo gains insight into the minds of humans. Meanwhile, Hades, the god of the underworld, quietly observes Ganymede and Apollo from the sidelines, leading Apollo to suspect that Hades is plotting something against Zeus. The story of Olympos tells a modified version of the myth of prince Ganymede, wherein he becomes a caged plaything for Zeus’s amusement, rather than a cup bearer for Zeus. While this shift in story offers more of an emotional/character-based focus for Ganymede and other characters involved, the actual execution leaves a little to be desired. Unfortunately, Olympos is far too wordy for its own good, giving the manga the feel of padding, and causing the overall pacing to drag, especially in the second half. The second half of the manga, which initially focuses on Apollo’s discoveries about the human’s worship of gods, offers an interesting change of perspective in the story’s narrative. For example, Apollo learns that the humans who worship him and the other gods attribute coincidental positive occurrences (such as rain after a dry spell) to miracles of the gods, who in actuality, have nothing to do with them. This brief exploration into an alternative view of human/god relationships in mythology ends up getting tossed aside in the remainder of the second half, where Apollo and Hades go on a rather lengthy drivel about a possible uprising against Zeus. The combination of needless length and wordiness with a general lack of focus on the characterization and emotion leaves Olympos with little to stand on outside of its mythology focus. Fortunately, Olympos does have a significant upside, which would be its art. At first, I was concerned I would be walking into a generic bishounen party, but aki’s artwork is a good step above what you typically find in many shoujo/josei faire. Apollo and Ganymede are depicted with long flowing hair and billowing stylized togas that add to the air of unearthly beauty the two possess. On the other hand the more hot-headed Poseidon, has a more reserved, yet firm style to his design with wavy hair and a long cape, while Hades has a dark, gloomy look, with multiple horns atop his head and a black shroud surrounding his body. His design doesn’t veer too far from aki’s usual bishounen designs. Furthermore, the scenery depicted in the manga, while, sparse, also adds well to the atmosphere of the story. Zeus’s miniature garden, which is shown as an endless field of flowers with a worn Greek stone structure at the center all under a perpetual starry sky, gives an air of loneliness to the cage Ganymede is trapped in. My only complaint is that aki’s designs for Ganymede, Apollo, and Artemis suffer a bit from same-face syndrome, but fortunately this is less noticeable as the manga goes on. Pros: Wonderfully detailed artwork adds well to the fantasy atmosphere, from the long flowing hair of various characters, to the endless floral scenery of the miniature garden. The story has an intriguing look into human/god interaction in mythology, exploring what would happen if the gods were minimally involved in the occurrences of the human realm. Cons: Tends to get overly wordy at times, which make the manga feel more than a bit padded, especially in the second half. A few characters border on having same-face syndrome. The story isn’t especially substantial, and doesn’t do much to stand on its own if you aren’t a fan of the mythology aspects. 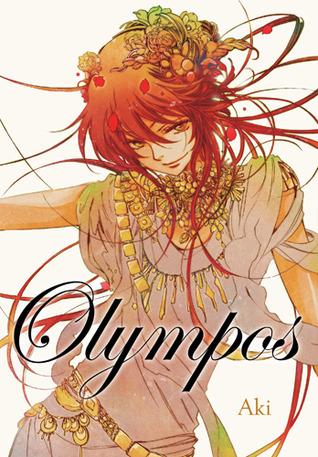 Olympos is published in the U.S. by Yen Press. While Olympos tries to make an interesting spin on a certain story from Greek mythology, it feels rather long-winded and insubstantial in the end. If you are a fan of anything Greek-mythology flavored (with a bonus of having pretty art to look at), Olympos might satiate you, but otherwise I’d say to spend your time elsewhere.